There could be no greater joy to the mortal humans than being exposed to a burst of flavors on a plate full of simplicity. Encountering these moments usually leaves the otherwise health cautious lot of the 21st century oblivious to the matter of calories at least for a while, and revel in the straightforward gleeful and undeniably affectionate recipes of our ancestors. 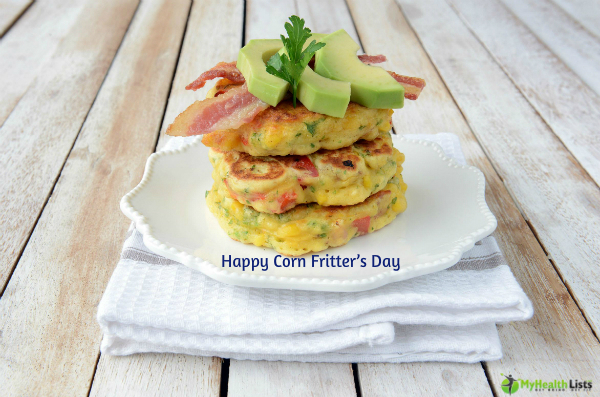 This is perhaps one of those reasons why the 16th of July is observed as Corn Fritters Day. This is a tribute not just to this century old recipe but also to mark the blessing of the Universe that has descended on humanity in the form of multi nutritious Corn. Considering the fact that the weight watchers have been inculcated with the undeniable truth behind consumption of corn and adding to the flabs, you can be certain that indulging in the glory of Corn Fritters for one day in a year is something that you owe yourself. When the rest of the nation celebrates, you must celebrate too. For all you know, you could sweat it out over the next 7 days. However, if your conscience is still biting your love handles and you wish to enlighten yourself about a healthy way to approach the glorious July 16th, here is what you can do to make things easier and better for you. 1) Introduce Slight Alterations to the Recipe – Classic corn fritters are usually made with corn kernels, eggs, milk, flour and molten butter. When deep fried, you could expect this recipe to result in over 400 calories per bowl. However, if you make slight substitutions like, choosing a healthier option of grease and doing away with the yellow of the eggs, there is a fair chance that the calorie count would come down by a considerable extent. At the same time, you are sure to be free of the onslaught of additional adipose if you substitute deep frying with baking. 2) Walk to Your Favorite Southern Restaurant – Corn fritters had originated in the South. So July 16th is special to all restaurants and joints that are dedicated to the flavors of this agricultural belt. On walking down to the latter therefore, you will be sure to get pleasantly surprised by the sheer vividness of the corn fritter options you could avail from the menu card. On looking closely and at the right places, you are sure to locate some low calorie options that you could gorge on Guilt-Free! At the same time, the aspect of ‘walking down’ should not be neglected. A thousand brisk steps or more to cover the distance to and fro will only help you speed up the calorie burning process. So, go right ahead and make 16th July the most memorable day for your taste buds without hassling your conscience about the flip side of all things scrumptious and wonderful!